It’s a boring Tuesday morning at the office. You quietly say you’re going to pick up some coffee, and five other people instantly raise their heads above the cubicle walls, eyebrows raised in the hopes that you’ll ask if anyone else wants anything. This, of course, creates a huge headache for you, the office lackey who just wants to enjoy a cup of Kenya Estate in peace. Now you’ll have to remember all of those drink orders, then spend ten minutes dumping all of the requested sweeteners and creamers into each cup. If designer Josh Harris has anything to do with it, that sad scene may someday be a thing of the past. 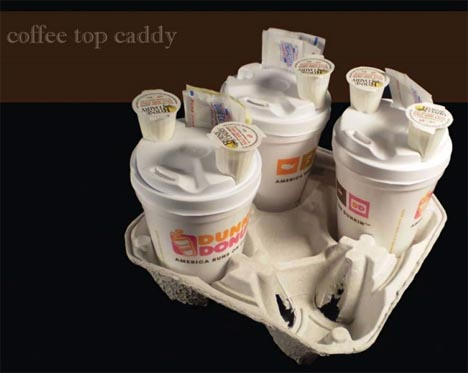 His Coffee Top Caddy design would put an end to balancing six cups of coffee in one arm while wildly grabbing at sugar and creamer packets with the other hand. 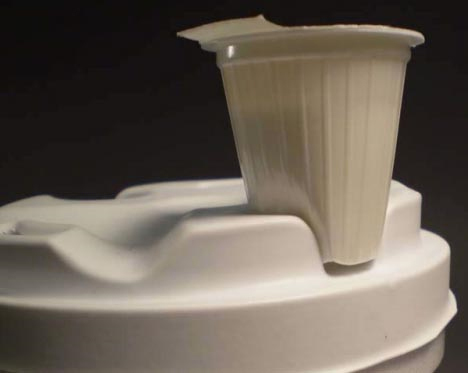 This ingenious coffee cup lid design includes spaces for carrying all the accessories you need for your java. It’s small steps like this that really move design forward; the designer hasn’t reinvented the mousetrap or come up with something the world has never before seen. He’s just taken an existing product and made it a little better. And since it’s made with the same materials and the same basic structure as the existing solution, this idea is firmly within the realm of possibility. See more in Industrial Design or under Technology. September, 2009.